After yet another school shooting in the United States, the 19th this year, Pat Buchanan wrote a brilliant analysis. The following is a quote from his article, posted this morning. “Another factor helps to explain what happened Wednesday: We are a formerly Christian society in an advanced state of decomposition. It’s not just that US schools are unsafe, it’s clear to the rest of the world that America is a very violent country, with a governmental system that doesn’t work any more. As one writer put it, the US has an eighteenth century constitution in a twenty first century world. Most countries already have a bad impression of the current US president. But, when Mr. Trump spoke following the shootings and talked about mental illness, that impression only worsened. Mental illness was (and usually is) a major factor, but what differentiates America from other western countries is easy access to weapons. Even the mentally ill can walk into a gun dealer and buy an assault rifle! 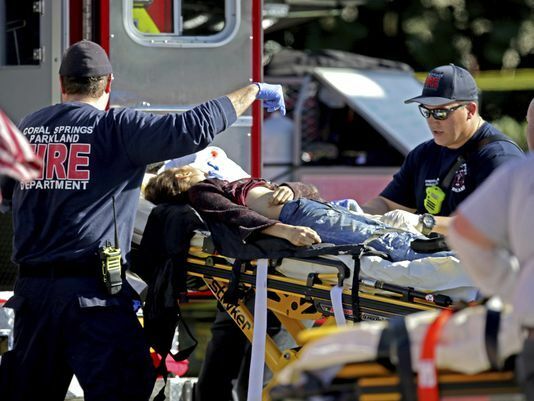 Parkland will not be the last school mass shooting. The new grand coalition in Germany is planning a massive expansion of the German army (Bundeswehr) mission in Iraq. This was announced by Defence Minister Ursula von der Leyen (Christian Democratic Union, CDU) in the course of her trip to the Middle East last weekend. Von der Leyen praised Germany’s cooperation with the Peshmerga [Kurdish military forces] during her visit to Erbil, the capital of the Kurdistan Autonomous Region in northern Iraq. The Bundeswehr has been arming and militarily supporting the Kurdish force for three and a half years. It was “impressive to see the great success of the Peshmerga training mission,” she said, thanking “Bundeswehr soldiers” on the spot. Von der Leyen then announced that in future the Bundeswehr would be deployed throughout Iraq. The Socialist Equality Party rejects the coalition pact, which focuses on the return of Germany to an aggressive foreign and great power policy, and calls for the disclosure of all the talks. Under conditions of escalating warfare in Syria and Iraq, and US preparations for war against North Korea, which threaten to provoke a Third World War, this demand, along with the demand for new elections, is becoming increasingly urgent. The overall objective of President Macron’s plan is to ensure that French law takes precedence over Islamic law for Muslims living in the country. The plan, as currently conceived, is vague and short on details, but appears to involve three broad pillars: determining who will represent Muslims in France; delineating how Islam in France will be financed; and defining how imams in France will be trained. (Own report) – In Washington serious warnings are being raised against an independent German-European military policy aimed at weakening NATO. The militarization of the EU is being supported as long as “it is complimentary to NATO,” a senior Pentagon official was quoted. However, Washington would intervene if Berlin and the EU were to pull military resources away from NATO and use them for their own wars. This statement was made in light of the NATO defense ministers’ meeting that begins today, which will include a decision on the establishment of two new NATO headquarters. One will be established in the United States, to secure the military supply routes from North America over the Atlantic to Europe. A second will be established in Germany, to optimize rapid redeployments of West European troops eastwards across the continent. At the current stage of planning, this will be under German sovereignty and available also for use outside of the NATO framework. Finally, Mo Ibrahim has found an African president worthy of the $5 million prize the Sudanese billionaire offered to any leader who would step down after losing an election. The prize goes to Liberia’s Ellen Johnson Sirleaf. It’s been eleven years since the prize was established. “Ellen Johnson Sirleaf took the helm of Liberia when it was completely destroyed by civil war and led a process of reconciliation that focused on building a nation and its democratic institution,” said the head of the prize committee.